I enjoy traveling. A favorite destination was rural Nova Scotia. I am a closet genealogist. Mennonites, shipwrights, divorces, oh my! I like food, especially as it relates to place and culture. Home is where I smell BBQ. I once was in a writers group. Do you think it helped? Assassination Vacation, Sarah Vowell’s 2005 book, offers witty commentary about her travel around the United States researching the assassinations of former presidents. Midnight Rising, Tony Horwitz’s 2011 book, vividly recalls John Brown as he prepares for his raid on Harpers Ferry in 1859. I enjoyed his book Confederates in the Attic, too. At Home is Bill Bryson’s excellent 2010 history of domestic life told through a series of colorful stories about everything from furniture to architecture to fashion. 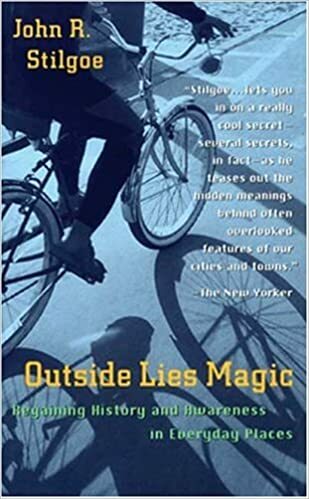 Outside Lies Magic, by John R. Stilgoe, teaches readers how to observe and appreciate ordinary places. Dead Wake features Erik Larson’s broad research and brings to life the many stories of the sinking of the Lusitania. Common People: In Pursuit of My Ancestors, by literary historian Alison Light, is a lovely blend of local history and family recollection set within a broader social and political context resulting in a story that is quintessentially English. Book of Ages: The Life and Opinions of Jane Franklin is my favorite of Jill Lepore’s many books. This story of Benjamin Franklin’s younger sister provides a rare look into the world of Colonial-era women through the eyes of Jane Franklin, a mother of twelve who loved reading and writing. The Vault is Slate’s guide to historical treasures, oddities, and delights. Atlas Obscura is a collaborative website, to which I occasionally contribute, telling stories of the world’s “wondrous and curious” places. Uncommonplace Book, by self-described hybrid historian Elizabeth M. Covart, is an excellent blog about history and the practice of history, including scholarly history, public history, and digital humanities. The Brain Scoop, by Emily Grasslie, Chief Curiosity Correspondent at Chicago’s Field Museum, takes online visitors behind the scenes to check out the natural history museum’s research and collections. Backstory is a Virginia-based public radio program featuring three American historians – or “history guys” – who rip a topic from the headlines and give it some historic context…in a fun way. This American Life is part journalism and part storytelling. Stuff You Missed in History Class, which sort of explains itself. Planet Money, the economy explained. I follow all things Jayhawk, the Kansas City Royals, and generally anything involving a ball. Tennis anyone?